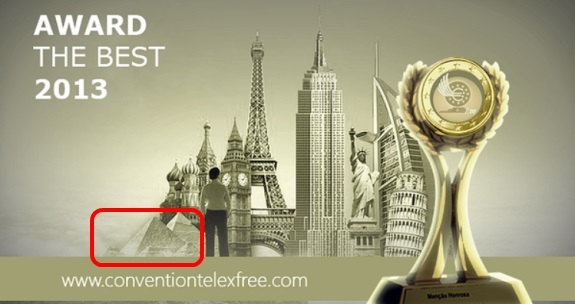 Prior to TelexFree’s bankruptcy filing, this curious graphic was used to promote the “program’s” purported “international convention” in Spain. Red highlight by PP Blog. URGENT >> BULLETIN >> MOVING: Carlos Wanzeler refused to resign from TelexFree-related entities and has been fired by interim CEO Stuart A. MacMillan, according to new filings in the TelexFree bankruptcy case. MacMillan also caused the resignations of former TelexFree President James Merrill and interim CFO Joe H. Craft, according to the filings. MacMillan now is controlling the TelexFree businesses. Whether the moves would satisfy the SEC and the U.S. Bankruptcy Trustee, however, was far from clear early this morning. Tracy Hope Davis, the trustee, alleged last week that there were “reasonable grounds” to believe that “criminal conduct” occurred at TelexFree. Whether he had a preexisting relationship with Craft was not immediately clear. Davis is seeking the appointment of a trustee, a process that could put the firm on the path toward liquidation, rather than reorganization under Chapter 11. The firing of Wanzeler and the resignations of Merrill and Craft, according to MacMillan, occurred on April 17, a day after the SEC alleged that Craft was in the TelexFree office in Massachusetts with nearly $38 million in cashier’s checks and sought to leave the premises with the checks while a federal raid was under way. Wanzeler and Merrill are the asserted equity holders. They, along with Craft and TelexFree marketing director Steve Labriola, were charged with fraud April 15 by the SEC. Four alleged TelexFree pitchmen also were charged with fraud. Despite the pledge to cooperate, TelexFree is resisting the SEC’s bid to transfer the bankruptcy case from Nevada to Massachusetts. The Debtors chose the Nevada Bankruptcy Court because inter alia TelexFree Nevada, a Nevada entity, is a counter-party to more than 700,000 contracts governed by Nevada law. The Debtors anticipate that nearly all of the claims against the Chapter 11 estates will result from these contracts. Although both Nevada and Massachusetts residents will be asserting some of these claims, the Debtors’ creditor base resides all over the world. Some 90% of the creditors reside outside Nevada and Massachusetts. In fact, approximately three-quarters of the creditors are from foreign countries. MacMillan also suggested today that Wanzeler and Merrill owned TelexFree Dominicana, a company to which a cashier’s check for more than $10 million was made out just days before the April 13 bankruptcy filing. The check and nine others, including one for more than $2 million made out to Wanzeler’s wife, were seized by federal agents on April 15, after being found in Craft’s possession. MacMillan said he did not believe that “Mr. Craft was attempting to divert any of the Debtors’ cash or other resources. Runge, a turnaround specialist, is TelexFree’s chief restructuring advisor. MacMillan, in his declaration today, said it was his “understanding” that TelexFree “struggled to maintain a consistent cash management system. This may be the cash that was used to acquire the cashier’s checks. Regardless, the account closures signaled serious trouble for TelexFree, which the SEC and the Massachusetts Securities Division alleged have a history of not disclosing important information to members. The assertion by MacMillan potentially means that TelexFree continued to gather money from both existing participants and new recruits after one of its key vendors notified it that an account was being closed. Beyond that, if Merrill and Wanzeler owned a company in the Dominican Republic, it could lead to questions about whether they owned other firms in offshore venues and diverted money to those entities. The same circumstance of account closures by major vendors arose in both the AdSurfDaily Ponzi scheme in 2008 and the Zeek Rewards Ponzi scheme in 2012. What a load of crap. These guys are absolutely amazing. I also heard an audio of this MacMillan saying everyone was going to get paid back the money once Telexfree went bankrupt. Hellooooo…..Has anyone showed him the monies math yet? I would predict we will only see more of the same before this saga ends and the inevitable happens. Many observers predicted the AdSurf Daily / Andy Bowdoin case could be dragged on for up to four years, which turned out to be pretty close to the mark. What this does, however, is clarifies why it is the authorities choose to go down the civil route, rather than go via the criminal system. At least now, Telexfree has been effectively stopped in its’ tracks, no more victims will lose their money (unless they try really hard) and most of the assets are frozen. Imagine how victims would feel watching these nonsense delaying tactics being employed and there had been no civil action freezing things until a criminal case finally made it to court in two or three years. Exactly and this is what matters first. I have great confidence in Galvin and the other government agencies that the proper path and sanctions will be handed out. If the Ponzie 8 are out of jail for a year or so is fine with me….it will be one miserable few years for them. Financial ruin, social embarassment, legal misery, family shame….I’m ok with them experiencing this before they adorn the steel bracelets that go so nicely with the orange jump suit the state will provide them. I’ve had a strong feeling all along that this case is going to change the laws in the world of MLM. This one didn’t just surpass the radar it went galactic!!!! Quick note: Looks like the bona fides of Wings Network, a TelexFree knockoff scam, are being questioned in Madeira. We may be witnessing the greatest MLM crime wave in history. It truly is whack-a-mole. People are being scammed of billions of dollars and the money is flowing to networks that proceed from one scam to another. “Yet people have not reported the case. People tell us that they will not report because they are hopeful that everything will be solved. I call upon the citizens who are not tied to a false hope; the right thing is to denounce,” he said. Dorothy: This one didn’t just surpass the radar it went galactic!!!! Whatever legal nukes the governments have at their disposal would not be too much. These scams are beyond sinister. They are organized schemes to defraud on a global basis and pose an untenable security situation. Dorothy: These guys are absolutely amazing. I’d distill it this way: The government, through arguments in the district court in Massachusetts and the bankruptcy court in Nevada, put MacMillan on notice that it intended to connect lots of dots. MacMillan, through the filings yesterday, is reacting to the government signals. I think there is a specific reason TelexFree turned to Craft; I doubt it is a noble reason. There are lots of vagaries, but there is no doubt Craft is involved in the asset-protection business and, as the SEC says, has been involved with other MLM companies. I’d note that TelexFree, through its bylaws, appears conveniently to have licensed itself to make deals that were less than arm’s length — specifically in the area of intracompany loan-making. Also: Massachusetts has alleged that info given it by TelexFree did not comport with info TelexFree provided Washington state. Meanwhile, BWFC Processing Center LLC, a company linked to Craft, was the registered agent not only for TelexFree, but also SSH2 Acquisitions, a company linked to AdSurfDaily and Zeek Rewards figure Terralynn Hoy. Hoy was an alleged Zeek winner and a longtime apologist for the ASD Ponzi scheme. The net is the tool that allows the far reach of the modern day crooks. The good thing though is the net will also provied the proof that will help put them in jail. The social sites as well as Utube will be of great evidence for justice. Watching the Ponzie 8 online for the past year has been amusing to say the least. It’s like watching the guy who’s driving next to you on the highway picking his nose….Hellooooooo….did you notice your windows are clear???? It’s as though they thought no one else was watching other than the ones they were trying to scam. admin: I think there is a specific reason TelexFree turned to Craft; I doubt it is a noble reason. AFAIK, Craft was issuing the 1099’s and such paperwork for TelexFree. Before that, he claimed to be chief compliance officer for Financial Destination Inc, which is a MLM that later merged with Youngevity (another MLM) and let him go in 2011. That may be when he jumped onto the TelexFree bandwagon. Though I can’t tell who contacted who. Oops, make that CFO, not CCO. IMHO, MacMillan is setting himself up to be the bankruptcy trustee by forcign out Wanzeler, et al. He knows that telexFree is damaged property, and authorities are going to be watching every move he makes. I think he realized that there is no ‘saving’ TelexFree, even with Runge’s help. The only thing TelexFree has is the name, and it’s forever tainted. it has no sales force (just a bunch of Ponzi participants) as demonstrated by the “change” in comp plan, and it has no infrastructure to actually do long distance, when ISG Telecom bailed on them and state after state are revoking their telecom license. He wants to be trustee of the shutdown, instead of US Trustees appointing one, by claiming to be already familiar with the situation, is untainted by prior management (and the ‘firing’ is part of the act) and he wants to keep drawing his current salary, while incuring none of the risk of being associated with such a scam. I agree K Chang. Something stinks about the whole thing. Like allegedly ‘firing’ 2 people is going to make the whole thing better. I think ….this ain’t our grandmothers ponzie scheme. There is nothing to salvage from the Telexfree business. I think foremost in the courts minds will be to try and save as much money as possible. I don’t think Nevada will allow the bankruptcy since it is not in the best interest for anyone other than the company which is accused of being a world wide Ponzie scheme with no company or product to reserect. I think just as you say, MacMillan wants to continue to collect his pay just as the lawyers would love this to keep going as well. I don’t think the judge will allow it. People try and compare what’s happening here with a legitimate company filing for chapter 11. Telexfree is no candidate for Chapter 11 and the judge will easily see this. It would be kind of hard for the judge to overlook the SEC, FBI and Homeland security waiting in the wings for their wack at Telexfree. That MEANS NOTHING. What They are trying to do is evade criminal charges based on the childish notion that, “hey I was fired, just back date the firing date…” Hey, I resigned. Hey, I got the runs. Hey I got a headache. So I am no longer responsible. Justice in the U.S. is retroactive. If he was present the majority of the time the fraud was going on, THEN HE and others are responsible. No weaseling your way out of this now. Same with Sann Rodrigues claiming he is just a victim. lol. I just knew it was a scamming female. Like when a light is turned on, the coachroaches runs in every direction. You can imagine that, as a person stated above, some want to keep their jobs with TelexFree, others want to milk it to defend it in court and investors want their money back – so bankruptcy is NOT a good option, unless they want 10 cents on the dollar. AND, the owners and ringleaders want to make sure they don’t go to prison for 51 years for fraud, wire fraud, money laundering, ponzi orchestration, immigration violations (visa and green card terms state that you cannot have crime of moral turpitude), using false instruments, manipulating deeds and money transfers, inter-company money laundering, recruiting and managing illegal aliens in a ponzi scheme, etc. My guess is that every one “in charge” and “top promoters” that made large amounts of money with the scheme cannot use the excuse of “I didn’t know. I was a victim or I was fired/resigned. or some other lame excuse. The firing is burning and the stake is ready. They’re all under surveillance and so they cannot run and they cannot hide. It’s game over. Not sure what that’s all about.